2016 Tony Stewart #14 Mobil 1 / Last Ride / Chevrolet SS NASCAR diecast, by Action. The Stewart-Haas Racing #14 Last Ride Chevrolet SS was raced by Tony Stewart in the NASCAR Sprint Cup, Ford EcoBoost 400 at Homestead-Miami Speedway on November 20, 2016. This car features a pictorial highlight of his career, a list of his race wins, the signature of every Stewart-Haas employee and the words "Always a Racer, Forever a Champion" emblazoned on the hood. 2016 Tony Stewart #14 Mobil 1 / Brickyard 400 / Chevrolet SS NASCAR diecast, by Action. 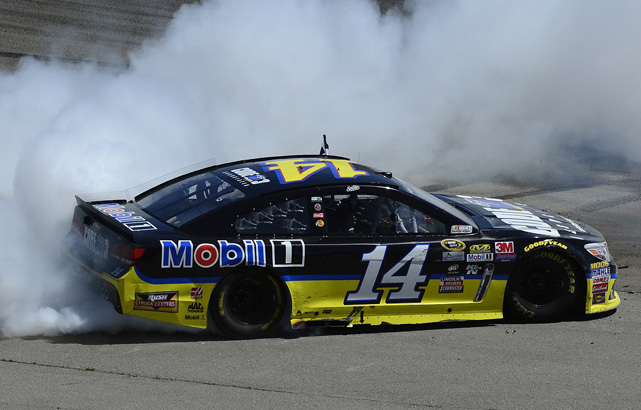 Tony Stewart raced this Stewart-Haas Racing #14 Mobil 1 Chevrolet in the NASCAR Sprint Cup, Crown Royal (Brickyard) 400 at Indianapolis Motor Speedway on July 24, 2016. 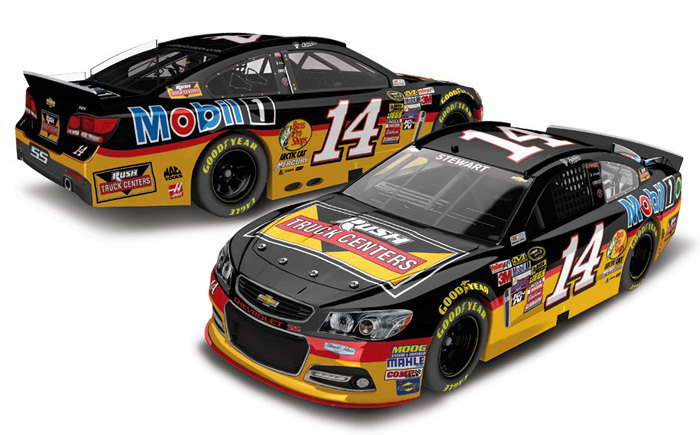 This diecast car is being produced to commemorate Tony Stewart's final Brickyard 400 race. * The 1/64 version is not a raced version and does not have the black tape around the hood, as pictured. 2016 Tony Stewart #14 Code 3 Associates / Sonoma Win / Raced Version / Chevrolet SS NASCAR diecast, by Action. Tony Stewart raced this Stewart-Haas Racing #14 Code 3 Associates Chevrolet SS to victory in the NASCAR Sprint Cup, Toyota Save Mart 350 at Sonoma Raceway on June 26, 2016. 2016 Tony Stewart #14 Mobil 1 / Chevrolet SS NASCAR diecast, by Action. The Stewart-Haas Racing #14 Mobil 1 Chevrolet SS was raced by Tony Stewart during the 2016 NASCAR Sprint Cup season. 2016 Tony Stewart #14 Rush Truck Centers / Chevrolet SS NASCAR diecast, by Action. The Stewart-Haas Racing #14 Rush Truck Centers Chevrolet SS was raced by Tony Stewart in select events during the 2016 NASCAR Sprint Cup season. 2016 Tony Stewart #14 Code 3 Associates / Chevrolet SS NASCAR diecast, by Action. The Stewart-Haas Racing #14 Code 3 Associates Chevrolet SS was raced by Tony Stewart in select events during the 2016 NASCAR Sprint Cup season. 2016 Tony Stewart #14 Bass Pro Shops / Chevrolet SS NASCAR diecast, by Action. The Stewart-Haas Racing #14 Bass Pro Shops Chevrolet SS was raced by Tony Stewart in select events during the 2016 NASCAR Sprint Cup season. 2016 Tony Stewart #14 Bass Pro Shops / Ducks Unlimited / Chevrolet SS NASCAR diecast, by Action. The Stewart-Haas Racing #14 Bass Pro Shops Ducks Unlimited Chevrolet SS was raced by Tony Stewart in the NASCAR Sprint Cup, Coke Zero 400 at Daytona International Speedway on July 2, 2016. 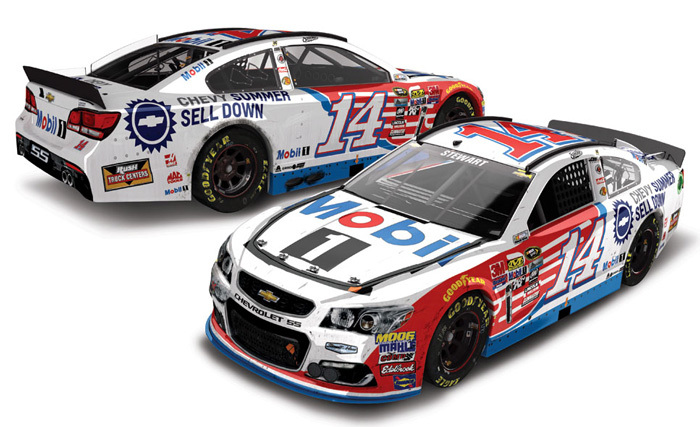 2015 Tony Stewart #14 Mobil 1 / Chevrolet SS NASCAR diecast, by Action. The Stewart-Haas Racing #14 Mobil 1 Chevrolet SS was raced by Tony Stewart during the 2015 NASCAR Sprint Cup season. 2015 Tony Stewart #14 Code 3 Associates / Chevrolet SS NASCAR diecast, by Action. The Stewart-Haas Racing #14 Code 3 Associates Chevrolet SS was raced by Tony Stewart in select events during the 2015 NASCAR Sprint Cup season. 2015 Tony Stewart #14 Rush Truck Centers / Chevrolet SS NASCAR diecast, by Action. The Stewart-Haas Racing #14 Rush Truck Centers Chevrolet SS was raced by Tony Stewart in select events during the 2015 NASCAR Sprint Cup season. 2015 Tony Stewart #14 Bass Pro Shops / Darlington Throwback / Chevrolet SS NASCAR diecast, by Action. 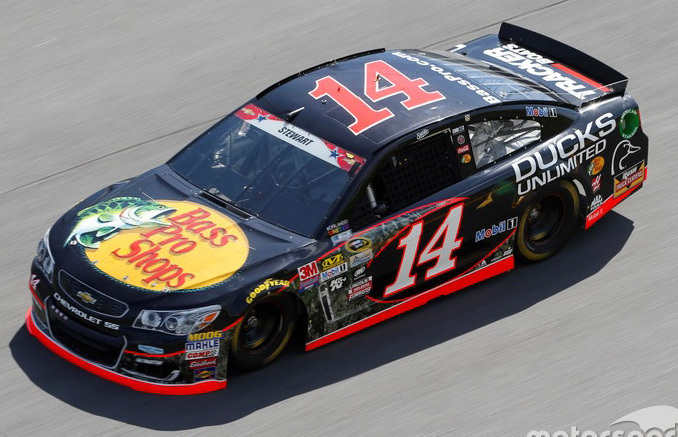 The Stewart-Haas Racing #14 Bass Pro Shops Darlington Throwback Chevrolet SS was raced by Tony Stewart in the NASCAR Sprint Cup, Bojangles' Southern 500 at Darlington Raceway on September 6, 2015. 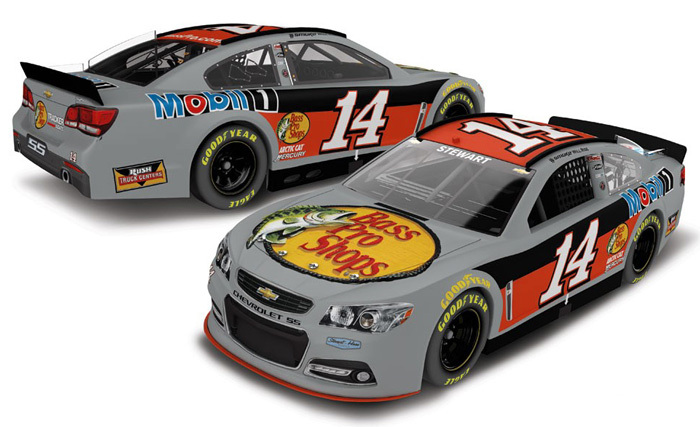 This paint scheme features an old-school Bass Pro Shops design and a 1970's-era logo. 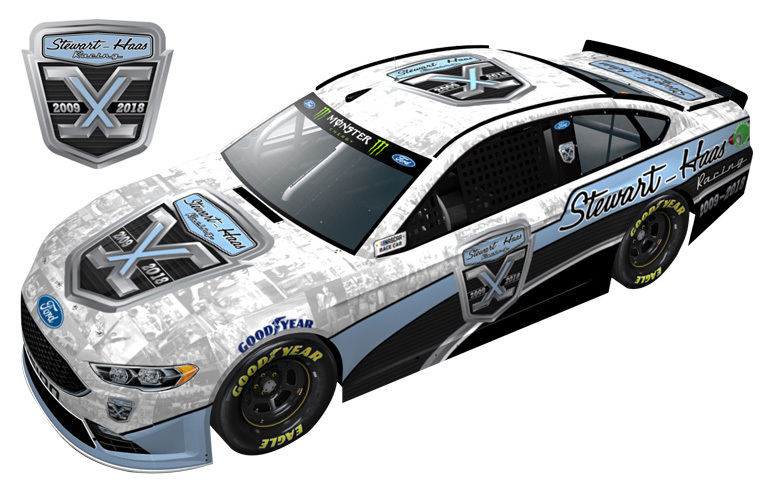 The diecast car will also be packaged in a special Darlington Raceway box. 2015 Tony Stewart #14 Mobil 1 / NASCAR: An American Salute / Chevrolet SS NASCAR diecast, by Action. The Stewart-Haas Racing #14 NASCAR: An American Salute Chevrolet SS was raced by Tony Stewart in the NASCAR Sprint Cup, Toyota Save Mart 350 at Infineon Raceway on June 28, 2015. 1965 Tony Stewart #14 Smoke / Chevrolet Chevelle diecast, by Action. 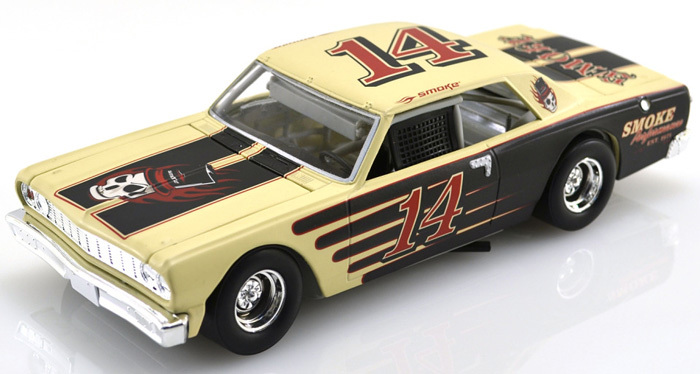 This 1965 "Smoke" Chevrolet Chevelle fantasy car was designed for NASCAR driver Tony Stewart. This car is the 1st release in the new Octane Garage line of diecast by Lionel Racing. * Note this 1:64 is an HO (Hood Open) diecast. 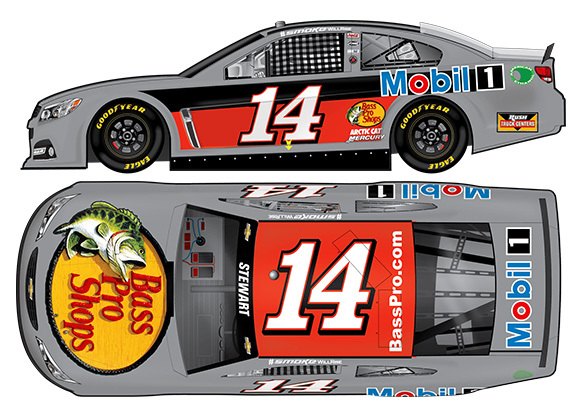 2014 Tony Stewart #14 Bass Pro Shops / Test Car / Chevrolet SS NASCAR diecast, by Action. 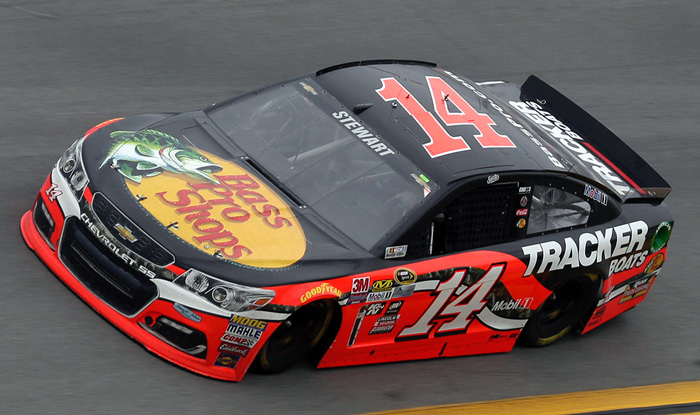 The Stewart-Haas Racing #14 Bass Pro Shops Chevrolet SS Test Car was driven by Tony Stewart during the NASCAR Sprint Cup test sessions at Daytona International Speedway on January 9-10, 2014. 2014 Tony Stewart #14 Mobil 1 / Chevrolet SS NASCAR diecast, by Action. 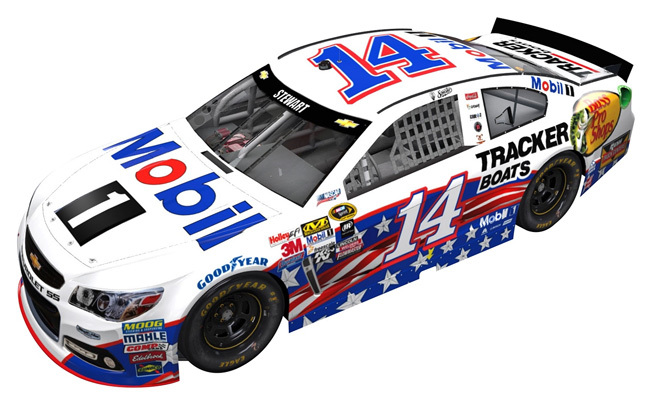 The Stewart-Haas Racing #14 Mobil 1 Chevrolet SS was raced by Tony Stewart during the 2014 NASCAR Sprint Cup season. 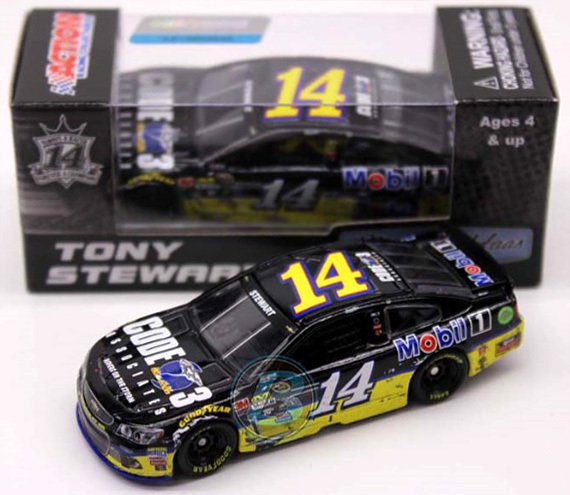 2014 Tony Stewart #14 Code 3 Associates / Chevrolet SS NASCAR diecast, by Action. The Stewart-Haas Racing #14 Code 3 Associates Chevrolet SS was raced by Tony Stewart in select events during the 2014 NASCAR Sprint Cup season.